Today on Authors to Watch, we'll get to know more about this wonderful romance author and actress (comedian!) 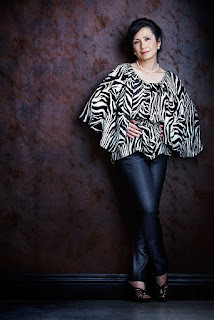 Eichin Chang-Lim. A multi-award winning indie author with several published titles. She's also an Optometrist, currently in private practice with her husband somewhere in L.A, and a devoted mother to Theodore and Victoria. How did you come up with the story of Flipping? What is the message of the story? The seeds of my latest book, Flipping, were there way before I wrote Tough Scratches. I infused much of my personal experience into Flipping, especially the part about raising a special-needs child, walking alongside him during his growing-up years, learning to let him go, and seeing him struggle to spread his wings and fight to be independent and be loved. Flipping stars a cast of characters determined to live life on their own terms. The story is set in Taiwan and California and follows the lives of two generations as they learn to deal with heartaches and celebrate their blessings. Love can overcome many obstacles with enough determination. The primary topic of FLIPPING : Can LOVE defeat all? Love comes in many facets and dimensions. True love is a journey with many turns; there are times the challenges are immense and the obstacles seemed insurmountable. Can love transcend all turbulence? Flipping also involves the following sub-topics: Family and friends’ support to a special need individual, overcoming the adversity, pursuing the dreams fearlessly, adoption as an option, gymnastics competitions, cochlear implant, Usher syndromes, and relationships between different races and opposite family backgrounds. All of the sub-topics revolve around the main theme: What is love all about? Fundamentally, Flipping is about intriguing, heart-wrenching and heart-warming love stories from two generations. Is there an advantage to being published by Dog Ear Publishing as opposed to self publishing? The reason for engaging with Dog Ear Publishing was to ensure the entire publishing process would be handled accordingly. I considered myself as a novice in the book publishing industry then. I have been learning the ropes of this field, gaining knowledge and confidence gradually. With the help of networking, I will definitely self-publish my books from now on. What do you do to get your books in the hands of readers? That’s a million dollars question. First, readers need to be aware of the existence of my books. The only way to make that happen is through marketing. Nowadays, social media is the primary tool of marketing. This field has evolved rapidly in recent years; it takes efforts and guidance from experts. You're also an actress / comedian. What do you love more, acting or writing? Acting and writing both stimulate my imagination and creativity; I like them both. However, acting is one of the most humbling experiences I have ever had; I encounter rejections and feel humiliated all the time. You could say that acting definitely pushes me to step out of my comfort zone and expand my life’s horizons. Writing is a highly enjoyable passion for me because I love telling stories. It’s my dream to tell inspiring stories of everyday people with a fun and easy-to-read writing style. Do you have other books in the pipeline? What are you currently working on? My next book is about raising special needs children. It's not a "How To" book. My goal is to let other parents in similar situations know that they are not alone. In the meantime, I'm in the midst of writing my fourth book, tentatively titled, "The Lovelock." It's a romance where the main characters struggle to overcome post-traumatic stress syndrome and depression. I hope to publish it in mid-2017 if everything goes as planned. What satisfaction do you get out of writing? Since I was young, I have had an affinity for reading the biographies of famous, historical figures that recount their struggles and how they overcame challenges in their lives. Writing is a form of art. To be an artist is to share one's soul with others. At the same time, I find it therapeutic. I enjoy being an artist more than any other profession. 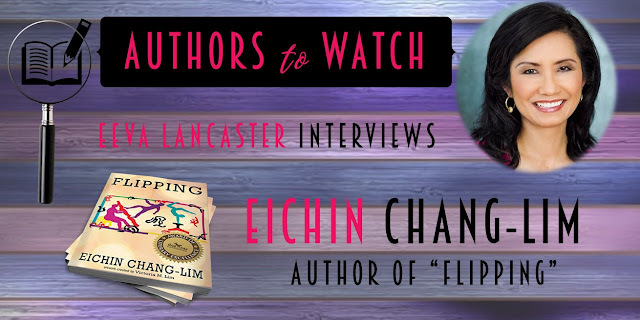 Who is Eichin, the woman? What inspires you? What makes you tick? I consider myself a dutiful person. I would put my happiness aside to fulfill the duties I was bestowed upon. I assert independent thinking; however, I have my vulnerability and insecurities. A comment from my dear good friend is, “You are such a typical Taurus.” What does that mean? Please don’t ask. A beautiful piece of music, like Chopin's Piano Concerto and a big bear hug, would melt me. What advise do you have for new writers? Do not be afraid of writing—you do not need to be a "perfect" or "great" writer. All you need is the desire to share your aspirations and tell stories. What is the best lesson you've learned from life? Can you share it with us? Thank you, Eichin, for sharing your thoughts on Authors to Watch. Eichin has pulled her book Tough Scratches 1 and 2 from the publisher, and will be relaunching it first quarter of 2017. 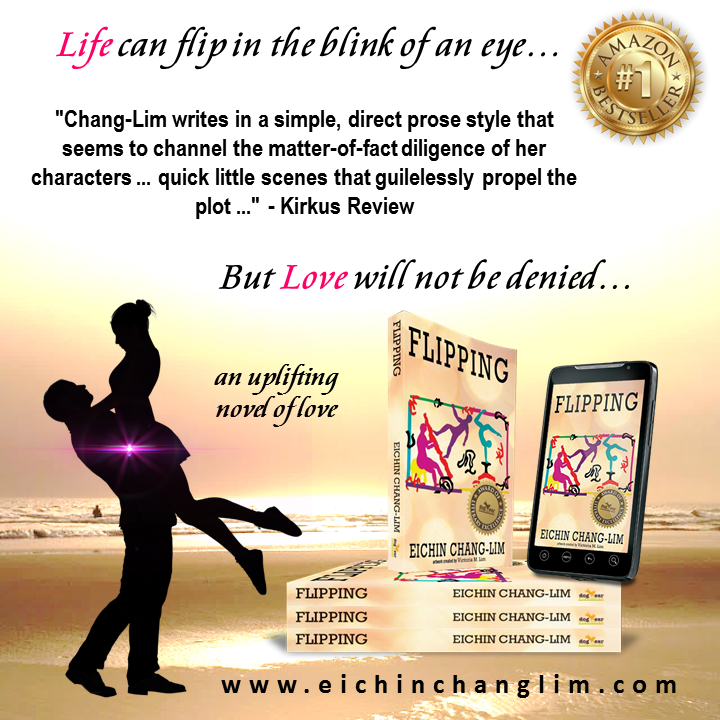 In the meantime, check out FLIPPING: An Uplifting Novel of Love.